I have been very busy these days, with keeping the house clean, working and getting Valentina ready for school. Every time I have sat down to write, I would create half a post and then think I'll come back and finish it... however; once I find time to write again, I find my thoughts on the post gone. So I start another one... Three times so far... and it isn't that I haven't wanted to write, it has been more that my thoughts are all over the place. I think it is because I have been watching too much news, something I had basically given up for many years due to the negativity I feel when I watched it... who needs that? Yet, there have been some very important things going on in the world lately, some of which I believe we need to be well informed on. I won't be giving my opinion on anything one way or the other but I will say this... I often have to pull back and watch a funny show like The Big Bang Theory or an old episode of FRIENDS. We all need a little laugh from time to time so that the negativity doesn't sink in. I often think of the uplifting quotes from Martin Luther King... 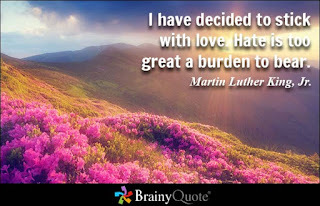 I totally agree with what he said above, I will stick with love, hate is too much of a burden. 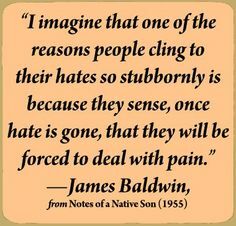 I think too many of us hold on to hate for much too long. We think if we let go of hate, we are saying what happened to make us hate something is okay. It's not saying that at all, I think by holding onto hate that we breed more hate, I don't want that in my life, I want love. For myself, I think about how my ex step mother Ruth used the excuse that my father cheated on her to abuse my sisters and me ... she held onto hate... I got to a point in my life at the age of 15 where I knew in my heart that hating her would only hurt me... I moved on and forgave her. My life could have gone one way by holding onto hate but thankfully I chose the other path. It was the best choice I made at such a young age... you would think that it would have been easy for me to choose love over hate. 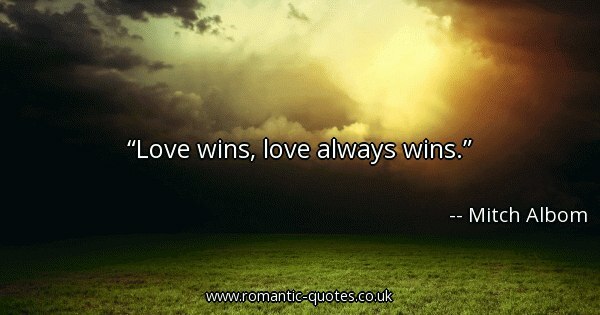 So true, love always wins!!!! your decision to stop hating him was the wisest, just so you can live in peace!!! Thanks for sharing this wonderful post my dear Launna! You know I am not reading blogs but for some reason yours popped up today and I wanted to drop in and say hello and to let you know that I am thinking about you. Yes, love always wins--sometimes we don't 'see' or 'feel' the win right away. It is hard to let go of those feelings against those who have wronged us---but---each time we turn it over and let it go it is a victory for us and, ultimately, freeing. You have overcome so much in your life, Launna, and I truly admire that you are taking the high road. You will be rewarded for that-even though you will have those days when you wonder if that is true. I agree with you that there is so much hate in our world today. We will be living in paradise if only everyone could choose love. Hope you are enjoying your long weekend. You are a strong person. It's easy to foregive in theory, but when faced with the trauma you've endured it's much harder. What a great time to read this post. 9/11 memories all around. September is a new beginning for a lot of us. Its good to share and find the hope we need to carry on. I so love that phrase.. LOVE WINS! Thank you for the inspiration! I know in many of my stories, its usually the past that can't be let go. All the best! I am so happy that blogging got me to know you as a blogger and as a person.. u have seen so many things, survived it n yet u always stay positive n push urself even more each day and I like that abt u.. in some way or the other u may have inspired so many people..
Dear Launna, I'm back. Holidays are over... I agree with Martin Luther King, hate weighs down the soul. I'm very happy that Mother Teresa has been canonized as a saint, she spent her whole life in loving deeply. I'm so glad you 've written a post . this quote of Martin Luther King is very beautiful. I really like Friends and Big Bang theory too and I understand you, because I don't like watch news... They are so negative. Launna! Todos aqueles produtos que mostrei são bons e baratos. Adoro! hehehe! Eu gosto de assistir noticiários, mesmo sendo negativos. Acho que vejo mais pela paixão por TV (afinal, sou formada em Jornalismo)! Mas é sempre bom ver algo mais leve e divertido. Sou fã de The Big Bang Theory e Friends! Bom, você faz bem para si mesma escolhendo o amor. Não é fácil não odiar alguém que nos fez mal... Mas devemos perdoar, porque mágoas não fazem bem para o coração! Like youself I have been busy getting Mimi back to school and have just got back to posting today. I do not watch the news as it depresses me. Your quotes are very inspirational. The glipse of your back story and the way you deal with it is simply heroic. I hope not only do you have a great day but a great life. I sometimes have to avoid the news too. I just can't stand all the negativity it generates. Love is definitely the winner in my opinion. I'm having a wonderful holiday weekend. I hope you are too! I completely agree - love always wins. There is so much hate in the world right now, but for those of us who love, we must keep on! Dear Launna, you are too good as to forgive people who have hurt you so much. I try not to hold onto hate, but I can't forgive bad people. I just ignore them and go on with my life. I believe choosing to hate is as bad as having an untreated disease. I couldn't. Love prevails not matter how difficult. It's definitely not a burden to carry it around. I don't watch the news for the exact same reason. More often that not they just make me cry... And yes, love always wins :) Great thoughts! I love that MLK quote. There is a time to process and a time to go through healing. And then there is a time to move on. Holding on to hate is basically choosing to ruin your own life, and potentially others' lives too. Excellent words Launna. I agree with you that; there's so much hate than love in this world. But this is also true that, a small change somewhere will bring about a big change all over the world some day. "Let's be the change we wish to see in the world." I know it's not that easy; but we can always try a little every day and on our every approach. This is very good advice Launna. Sometimes I go through phases where I can't bare to read about or hear any horrible news stories about crime and killing, as the details really stay on my mind. Then I go through phases where I read a lot of news stories, as I feel I shouldn't ignore things altogether either, and want to know about peoples' experiences. But it's always an uneasy balance, as I can't stand hearing about horrible things that happen, but as we all live in this world, we can't really remain ignorant. I agree with you, we have to make a conscious effort not to become jaded, and stay mindful of the good things around us as well. It's great that you've found ways to stay positive and overcome difficult situations. You're a strong woman and I admire you. You've overcome a lot and thank God for how far you've come. Keep the strength up and God will see you through. You're a motivation. I hope love wins, Launna, because I've given a lot, but always get hurt. Keep me in prayers. I try to avoid watching the news myself as I feel the same way you do, there are too much hate, violence and pain in the world today. I admire your ability to forgive your step mum at such a young age, Launna...it seems that your road has never been easy from the start. I enjoyed a lot your sweet and deep post! Launna, may you find justice, but most of all, may you find peace. Let love win in your heart always! Keep shining, my friend. Have a Lovely wed darling! Love wins. Love always wins. There's still the time of pain in wrestling with letting go, forgiving, accepting. Stay strong Launna. YOu have an amazing spirit. YES! Unfortunately we do have to watch the news sometimes but it is terribly depressing. All the negativity. All the hate and anger. Big Bang helps! You're absolutely right. Nothing good ever came from hatred. Love may not always win the day, but it's still the only road for me. Love and hope always wins at the end. I agree with you, Love always wins! No matter how bad things get or what people may have done. The best thing is to use compassion as your guide to get you through it. Hope you have a great rest of the week Launna! Love is very strong so that it can beat anything i believe! Aqui no Brasil a marca Vult faz sucesso! Todos os produtos são incríveis. E aquele lápis é maravilhoso, Launna! Your posts are full of inspirational. The more people read your posts the better. I agree with you. Love is such a positive emotion that hate does not stand a chance. I wish that people who hang on to hate, stop hating and give love a chance just once. Then they will understand what they are missing out on. Thanks for stopping by my blog. It helps when people know that there is hurt out there, so healing can start. Love always wins. I love that! But I feel you, I have a lot of posts that need to see the light of day and I'm thinking no they wont, haha. But yes, way too much negativity on the news. Very sad. I watch little women LA and I loovveeee little women Atlanta. The twins Amanda and Andrea are the reason I watch, love them! but back to the topic, i thinks it was so amazing of you to forgive your ex step mom. Love won and ultimately you did. Yes I agree with this post! Love always wins, Nobody can separate if between them are already in love, when the storm hits, it will not be able to separate. In the end, love will bring them together. Very Great Post! I love to read them all. Thanks for sharing! Dear Launna; it is really sad life moments, but I am happy for you that you find left and find your own way. Yes, Launna. Hate is no way a solution, but we need to take necessary precaution on those hurting us. I'll second that. It's the reason I try to keep the tone of my blog very positive and light. We get weighed down by enough of the other stuff on our own. Holding on to hate does a lot of damage. It isn't always easy to forgive- but letting go of hate is freeing and love does so much more for us than hate. What a great post! Your positivity is wonderful. I, too, try to live life peacefully and that means... avoiding a bitter personality sprung from hate. It's so much more energizing to live and share happiness and love. Hope you've had a good weekend and are having a great weekend!! Yes, You always inspire me. I was busy in college work from last few weeks and couldn't reach your posts. Feeling wonderful after reading this. I haven't watched the news in years, for the same reason as you. It always left me depressed and upset because of how bad everything is. I have to watch it sometimes when a major incident happens, like it has done often in the last couple of years, but I prefer not to. I can't deal with it. Hate is one of those things that manifests into evil and creates such a negative energy around you, it's hard to be in that. Love is always the better option for your own well being, as long as it's not forgiving someone and putting yourself right back in the same position for it to happen again, just learning and moving on without harbouring the negativity. I agree with you 100%! Launna! Aquela loja tem peças fofas. Fiquei desejando muitos vestidos de lá! Uma pena que a Receita Federal aqui do Brasil cobra taxas bem caras por compras internacionais! Launna, I'm so proud of you. You're someone who's been through so much in life and yet you choose to come here and spread love. I don't know if I'd be doing the same if I were you. I'd like to think that I would, but I don't know. It's like you're soul is in such an elevated place, emotionally and maturely speaking. In my case it took me a long time to realize that forgiving someone who hurt me wasn't the same as saying "it's okay". But when I finally let that hate go I really felt free, You're right, who wants that intense negative feeling in their lives? Have a great start of the week my sweet friend! Forgiveness is the hardest pill to swallow, but so worth it in the end. I don't watch the news either bc it gives me anxiety. Have a nice week Launna. Sometimes we need to pull away from all of the negativity and experience something funny or uplifting. Dearest Launna, I am so sorry to hear this but I am very glad that you are able to move ahead! It isn't easy to do but it helps us a lot more than hanging onto things that are past...even though they may still affect us today. Sending you much love and warm hugs. This is something which is incredibly hard to do in reality despite how much we may want to, but a lot of benefits if possible. I appreciate you doing a post on this. It’s interesting you mention it doesn’t make what someone did to us ok- because this is the aspect I’ve struggled with the most. I really liked this post, dear Launna! Ok, I'm not so good as you are in forgiving (I think it needs much more maturity and wisdom than I have), still I always evitate to hold on on hate or grudges since I think it's like poison that affect me more than anyone else! So normally when someone hurts me, I simply delete him or her to my life, even saying this face to face if it's needed. I'll never help him or her in case of needing, I'm sincere, but I'd never try to revenge as well, simply delete. Gostei muito daquele demaquilante, Launna! Apesar de não ser o mais potente, ajuda bastante a remover a maquiagem (e de maneira prática)! Dear lauuna, i felt same with you. I wrote half post then save it in draft. I thought to continue my write after finnished my work but when i want to continue i lose my feeling about it. Looks like you really busy now. Eventhought you are busy please dont forget to take a rest and keep healty. Well for forgiven some one is difficult but you heve to try and you have done. I proud that you can move on from all problem and learn from it. For you x step mom and andrey who hurt you can forgive them no body can do that, its awesome. some people held the pain and hurt and still there took the wrong way to made the other hurt too. You are extream cool dear! Hey beautiful Launna, hope your week has been great! Sending love. 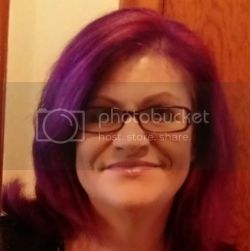 HI Launna I just wanted to drop by and say hi! Hope all is well with you. Lots of kisses from Italy!